Have you been using stochastic oscillators in your own trading? That’s the only way to make systems. I trade based on the same kind of visual setups, but usually just use the middle of the standard bollinger band (20 MA) with a quick look at MACD to confirm that the retrace is fading. I’ll have to add the dual stochastic to my other confirming indicators! Excellent article! That’s a great idea to add other confirming indicators. excellent indicator for signal approval. I like to mix it with momentum-signals on short time frames. Stochastics is one of my favorites. Shaun, do you have this available in an EA for sale? I love the simplicity! I don’t, but as you know, I’m also attracted to simple, basic strategy ideas. hmmm, Shaun I thank for that article on stochastics. In fact, I threw these stuff out of my analytical tools. Perhaps I may mix the two- 1. Algo approach toward the candlestick -a mixture of the sb score and stochastics. if it is 75%, open sell position. if it is 25%. open buy position. but to combine the two- stochastics and the algo approach. Its testing time on my part. Again, I commend you for your fine work. May God bless you and your work..
hi Shaun, do you have any back test stats like winning% zscore etc… also any other settings for higher timeframes ? have you used this to swing trade on the daily ? I don’t have any backtests available as I’ve not run them. I also don’t have any personal experience trading this one. wow, I never thought of plotting dual-stochastic. I guess I have to pay someone to program it for me. Shaun, who programmed yours? You can overlay them directly in MT4… no programming required. 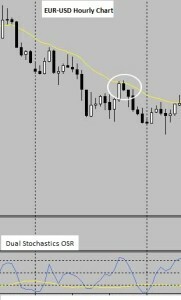 Drop the second indicator over the first indicator and not on the primary chart. 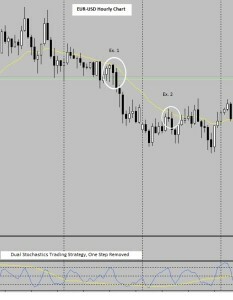 hi shaun which timeframe and pairs is this system best suited for? You’ll want to avoid the trending monsters like RUB or JPY. 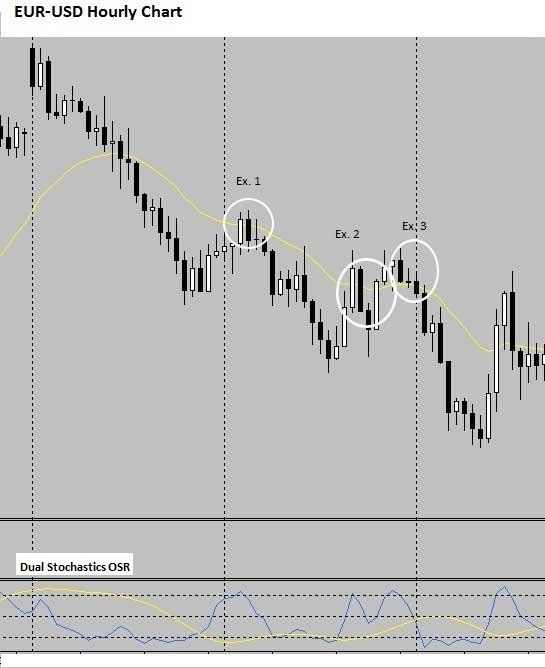 It’s better to stick to crosses like EURCHF or AUDNZD. You should interview Bill Young at GoForexPro. He does something very similar to this in his free trading room and it’s incredibly successful. Thanks for the great write up. I use a similar technique using RSI, same underlying principle. currently standing on 93% win rate based on just over 300 trades (average loss size <= average win size) – so you can imaging I am happy :-). 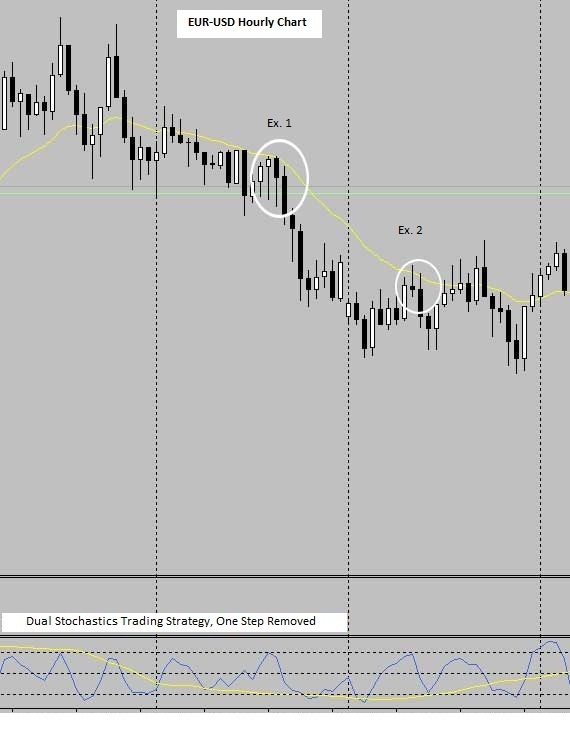 Obviously this method works best in trending market and you need to pick timeframe carefully. 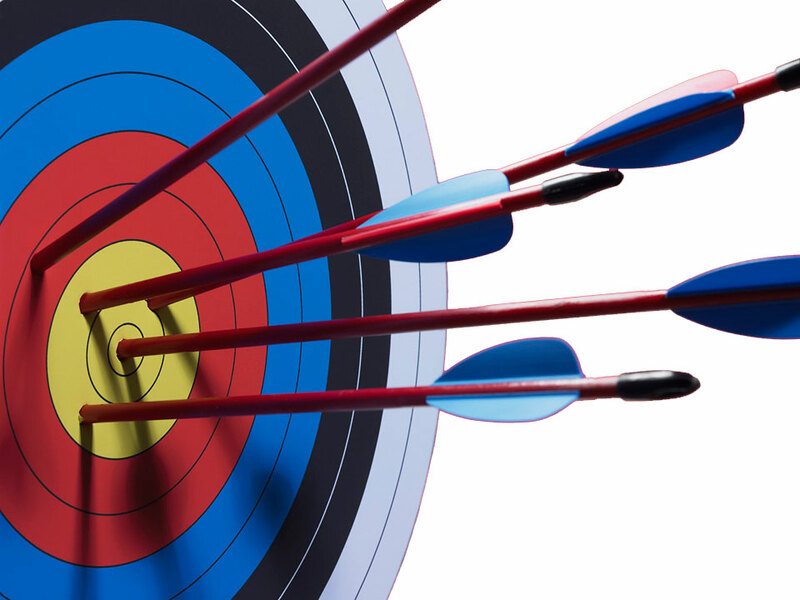 Trading live on EURUSD / EURJPY / XAUUSD / XTIUSD plus anything that looks right :-). A good approach is to play with the period setting Back-TestTestTest!! That’s awesome and congratulations on your success. Many thanks for sharing your ideas! Sorry but I do not speak English and use the Google translator . There is an indicator for the Dual Strategy Stochastic§ ? Yes. 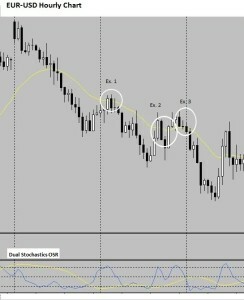 The article explains how to overlay two stochastics indicators in MT4. Do we use ‘Low/High’ or ‘Close/Close’ for the Stochastics ‘Price Field’ setting? And ‘MA Method’ is ‘Simple’, ‘Smoothed’, ‘Exponential’ or…? 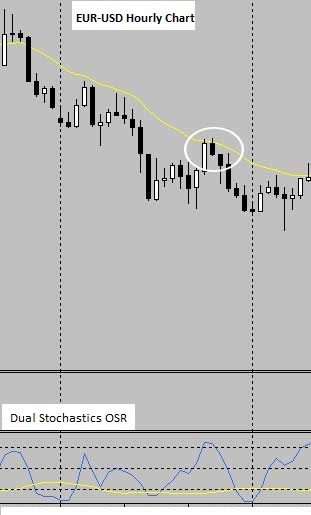 Cheers for sharing this trading technique! You can use either, but I’ve found that Close/Close is less noisy. It does not matter what MA Method to use – it does not work! Stratégie simple et pourtant très efficace. Excellent system, it accurately predicts entry point, however i am totally confused as to the action. Can you please explain in plain english when over & above 20/80 is this a reversal of the long term trend (couple of days) or something of a shorter time frame? (I’m using 1hr candelsticks as suggested). I understand the indicator but don’t know what action to take, buy/sell. It works well but i often choose the opposite action. Thanks in advance Shaun. Thanks, Andy. Overbought/oversold in a trend anticipates one of two things. Let’s use an uptrend as our example because it’s the most intuitive. If the market is in an uptrend and stochastics is oversold (OS), then you expect that this is a short-term price correction and a good buying opportunity. If the stochastics is overbought in our uptrend, it suggests the potential for larger upward moves. However, that is an extremely high risk time (i.e., a dumb risk) to enter the market. It’s better to wait for the pullbacks and let the exaggerated moves push your already open trade into profit. I would like to try this system. However, I use FXCM’s Trading Station and I’m having trouble setting up the chart. Trading Station has fast and slow Stochastic indicators, but they display in two different areas at the bottom of my chart and I don’t know how to get them into the same area. Also, they each have two lines (K & D). Any idea how to combine the fast and slow indicators in one area and only have one line for each? Thank you for replying. I’ll give them a call.